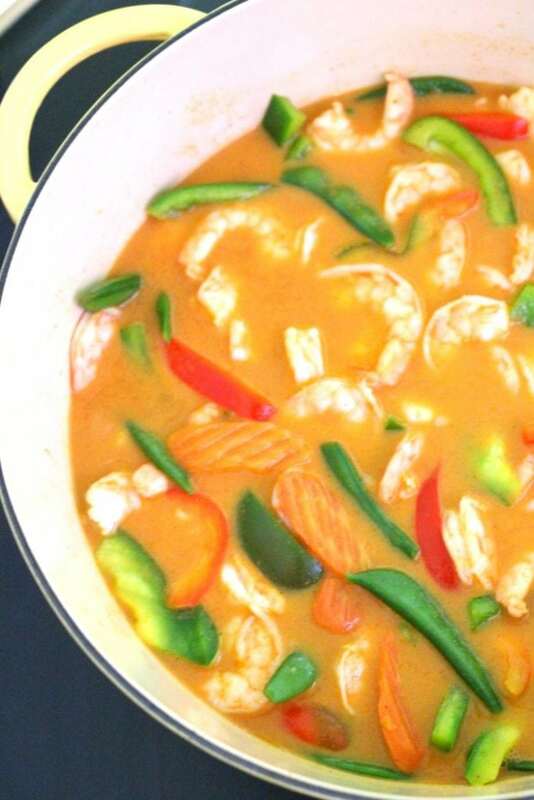 This Shrimp Curry is one of my very very very favorite quicky recipes. 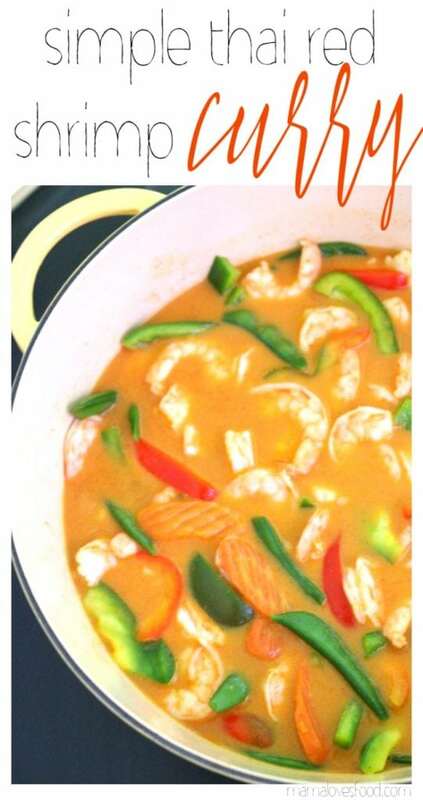 Heck, shrimp curry is just plain one of my favorite recipes. Bonus points for being quick. The flavor is on point, the vegetables are crunch and yummy, the shrimp adds the perfect amount of sweetness and protein. I just can’t gush enough about this Shrimp Curry made with coconut milk and red Thai curry spices. My kids even like it. Which, I honestly can’t decide whether that’s good or bad since it means I have to share. Even the two year old gets in on a bowl of curry! 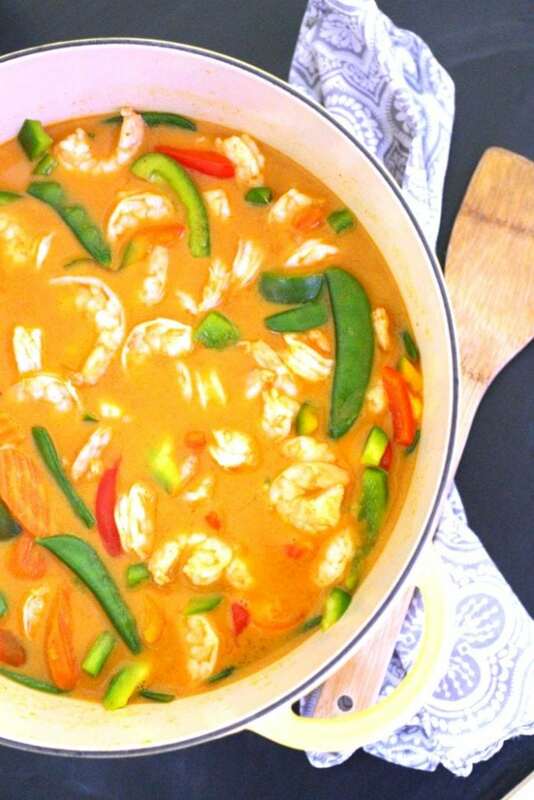 If you’ve never made Thai food, this Shrimp Curry is the perfect place to start. It all comes together in a few minutes, and is nearly impossible to mess up. It’s not spicy (although you could totally add some peppers if you wanted!) and my kids really do gobble it up. Traditionally red curry is served over rice, but you can enjoy it as soup (that’s what I usually do) or rice noodles. Even potato! Feel free to use whatever protein you like, but my strong suggestion is shrimp. Because, shrimp! If I’m in a big rush, I like to get mine already peeled (who has time?!). If you go with pre-cooked, that works too, just make sure you’re adding it right at the end and only long enough to heat through. I’d be so sad if your shrimp ended up over cooked. I’m sad just thinking about it! You can also also pick up pre-sliced veggies. I’m partial to green and red bell pepper, carrots, and snow peas, but by all means – if you want to try something else, go for it! And do please leave a comment letting us know what you tried! I strongly suggest using fresh vegetables over frozen. Bring coconut milk, fish sauce, curry paste and chicken stock to a low rolling boil. Add vegetables and cook covered approximately 2 – 3 minutes, until carrots are becoming tender but not soft. Add shrimp and stir frequently until shrimp is cooked through, remove from heat. 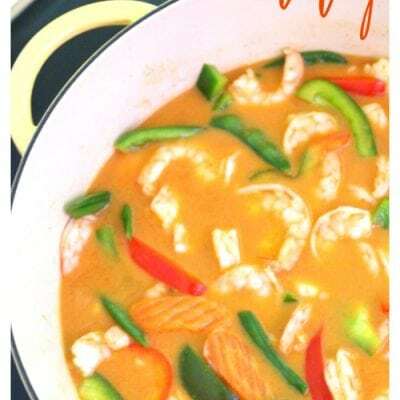 This Simple Thai Red Shrimp Curry Recipe is delicious and will make your day! Add vegetables and cook covered approximately 2 - 3 minutes, until carrots are becoming tender but not soft. This Shrimp Curry was originally a partnered article with Fresh From Florida. I live in Florida (go Gators!) so we’re lucky to have great locally grown Fresh From Florida produce and seafood like blueberries, tomato, sweet corn, watermelon, and *of course* seafood! Fresh From Florida and the Florida Department of Agriculture guarantees fresh and delicious food that makes your recipes delicious. It’s easy to create healthy and wholesome meals with nature’s finest ingredients for the everyone to enjoy that are locally grown in the awesome state of Florida. Florida has some of the best U.S. grown produce and seafood – and it’s sold right in your supermarket – not just in Florida. You can use this Fresh From Florida shopping list (click here) to find what’s in season right now. 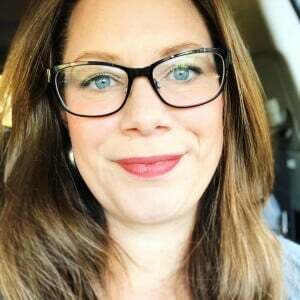 If you’re not sure how or what to cook, rifle through the recipes on my site (of course) and also check out the recipes and tutorials available on the Fresh From Florida website! Um…coconut milk…not included with ingredients, but is in the ‘Directions’. How much? What kind? Looks like a great recipe! Love this idea! Looks so delicious and I can’t wait to try! A new go-to for busy nights. Thanks for this quick and delicious meal!